About a month ago in this post I talked about how we were going to try and slow down this holiday season, rather than pack our weekends full of events and parties like we have in the past. I wanted to spend this month doing simple, fun activities as a family. I’m pretty bummed that Christmas is almost here already! Yes, I love Christmas, but the month leading up to it is my favorite part of the year. I’m not ready for it to be over! 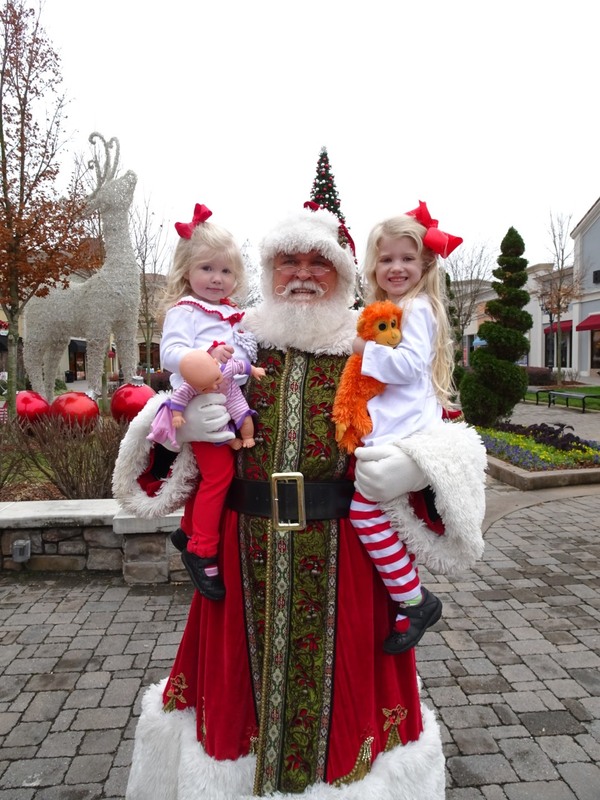 One of the things we look forward to doing each year is Santa’s Village. This year we went on a Monday night and we got there shortly after it opened. It wasn’t nearly as crowded and the line for Santa was not near as long as it has been in the past. We weren’t sure how Audrey would react to Santa, but we were pleasantly surprised. 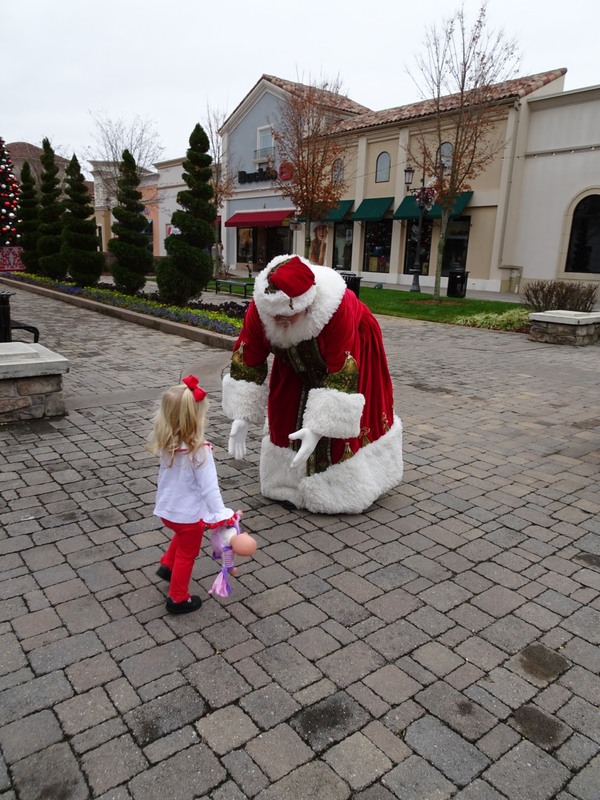 As soon as she saw him she nearly jumped out of her shoes, she was so excited! She stood there bouncing up and down saying “Santa! Santa!” until it was her turn. Once she got on his lap she was a little more apprehensive, but she didn’t cry. She even talked to him! My parents wanted to get a picture with the girls but Audrey was NOT having it. They finally got one with her while she was sitting in her stroller. She wasn’t smiling, but she wasn’t screaming! ha! Their favorite things are playing in the “snow,” decorating cookies, running through the maze, and taking pictures with the characters. A few weeks prior we had lost Raley’s “sock monkey” at the Galaxy of Lights. At least that’s the last time we remember having him. So Raley was super excited when he came knocking at our door one day with a note around his neck explaining where he’d been. 😉 We wouldn’t do this with many of their animals, but she is particularly attached to him and was heartbroken when he didn’t make it home that night. I’m glad their finally reunited! Something else I look forward to each year, now that the girls are old enough to help, is baking holiday goodies. We had a really great night baking and decorating sugar cookies as a family. Audrey spent a majority of the time putting little green dots on the same cookie. Raley (and David and I) were so proud of how well Raley did decorating. Her little smiley face on her gingerbread man was adorable. This particular day, and couple days previous, the girls were behaving and playing together so well. They were listening well, sharing well, and they asked me to build a fort so they could watch a movie together (I said yes). *Sidebar: I know that I’m sometimes guilty of posting photos like these that could lead others to believe that my children are perfect angels, but let me tell you, these times are rare. That day that we made cookies was a great day. I went to bed smiling, thinking how thankful I was for everything that happened that day. But about a week later, on another day we had set aside for Christmas family time, Raley was just obstinate, pushing our buttons, whining and throwing fits all day. She started out just straight up ignoring us when we would talk to her or ask her questions. We had several talks with her about acknowledging us when we talk to her by saying yes sir/ma’am, no sir/ma’am and she got put in time out several times for being disrespectful (our big word lately.) Each time she would sit in time out and would then calm down, apologize, we’d talk about it and give hugs and she’ move on. At that point we felt like we were doing an ok job. We had handled it calmly and she came out [seemingly] understanding the point we were trying to make. But then she woke up from her nap early and was cranky the rest of the night. She has always been more of a mamma’s girl and sometimes she can be so ugly to David when he’s just trying to, well, be her dad. When she woke up from her nap I was in the middle of wrapping some gifts, so he went up and met her on the stairs and was going to lay her back down to sleep for a little longer (this works most of the time for me if she wakes up early from nap – and she wakes up much happier the second time). However, when she saw him come around the corner instead of me she made this high pitched whine and threw herself on the ground. After that we couldn’t get her calmed down or reason with her for about an hour. I tried taking her up and laying her down. We tried letting her lay with David on the couch and watch Sofia while I cleaned up my mess from wrapping presents. Nothing made her happy except for me to hold her and even then she was still crying and I couldn’t talk to her effectively. Plus, I felt like if I did that, I was condoning her disrespectful behavior toward her father. After she finally calmed down from that (don’t even remember what finally did it) I had a long talk with her about respecting her dad. But she was just off the rest of the night. Short-tempered, willful, and just plain old disobeying. It also took her a while to go to sleep that night and she kept getting out of bed, which is frustrating for everyone. We went to bed feeling terrible, agreeing that we had no idea if we handled things correctly. I just hate times like these because sometimes you just don’t know what the right thing to do is. I prayed several times for tomorrow to be better than today – for Raley to be in a better mood, for us to have more patience and understanding, and for guidance so we can do what is right. These are things we don’t post on social media. We’re all guilty of it. We don’t like to take the time to advertise our kids’ misbehavings or other things that we are struggling with. And that’s ok. I don’t purposefully NOT show these things on social media. I honestly don’t even think about it. Why would I want to worry other people with my problems? Or why, in the middle of a temper tantrum that I’m trying to defuse, would I go grab my phone to take a snap shot? I’m saying all this to say – when you see that family on social media who looks like they have it all together and they’re always happy, just know that they have their struggles too, just like you and I do. They just may not put it all out there. And that’s ok. Try not to let envy take over because social media never tells the entire story. Anyway! We had not planned on going to the Madison Christmas parade this year, but at the last minute decided to get out in the freezing cold, bundle up and watch the parade. We got there 30 minutes early because they said they were closing the roads off, but they didn’t close them when they said they would, so we could have waited a little longer. We waited in the car as long as we could to stay warm then bundled the girls up in the wagon and found our seats. Audrey was NOT wanting to sit still in the wagon at first. She only wanted to get up and run around in the grass. We were thinking was this a mistake bringing them out here? Are we going to be chasing her around the whole time? But once the cars started rolling by she sat still and was pretty interested the rest of the time. They were too cute in their hats and little gloved hands waving at everybody! She ended up missing school 2 days that week so we got alot of good Mommy and Raley time together. She had been asking to have a tea party the last few days and I had said no several times because we just didn’t have time. But Thursday when she asked I said yes. I got out our tea pot and cups and saucers and she got her baby tea party set and we had a sweet little party at the coffee table in the living room. She’s so funny how she gives her guests (dolls) tea and snacks. See her poor right eye? She HATED the eye drops. It was the biggest struggle to get those in BID for a week! She was luckily well enough to participate in her Holiday program at MMO. This is the first year that she has sung on stage and done the hand motions. She’s always had some stage fright, so we were especially proud of her for getting up there and performing this year! She did a great job. That evening David and I got to attend our annual Tacky Christmas Party with our connect group at church. We always love spending time with these people! Last Saturday we attempted to make salt dough ornaments. I ended up making a ton of dough and baking them but they just didn’t bake up right. I was pretty disappointed because they were so cute! I don’t think I’ll try again this year (I ran out of salt!) but I’ll probably try a different recipe next year. This was the day of the meltdowns that I described earlier, but we did manage to squeeze in gingerbread house decorating that evening. All Audrey wanted to do was eat the candy out of the bowl. She put a few pieces on the house but then she was wanting to take them off the house and eat them too so she got disqualified (ha!) Raley had a good time putting the candy on. I love watching their creativity come out through little projects like these. I got a pre-made house this year, which turned out to be so much easier for impatient little ones! This week there was no school so we tried to take it easy most of the week. I was recovering from a stomach bug (yuck) and I now have a cold/sinus issues so I just have not been feeling 100%. Although I did get the girls out one day this week to go to the new Chicken Salad Chick in Madison (my favorite!). Then we went to Bridgestreet to find Santa. Santa had heart surgery and was in the unit where I work so we had to make a point to get our picture made with him! I love how he dresses and how he talks to the kids. He is just the sweetest man! So that’s our December. I’m happy to say that we did not travel anywhere this month and we spent a majority of our weekend nights at home as a family, even if some of them were challenging. I think we will try to make this an annual thing! Oh, one more thing I’d like to share because it just made me too proud. Our goal this Christmas was to focus more on Christ and his birth and to talk about the true meaning of Christmas. We were driving in the car one day and I heard Raley in the back seat talking to Audrey. She said “Audrey, what is all about Christmas [read: what is Christmas all about]? Is it about presents? Noooo. Is it about Santa? Noooo. It’s about Jesus was born!” My eyes teared up a little and my heart just about exploded when I heard my 4 year old telling her little sister what Christmas is about. We are spending the weekend celebrating with family and then I work Christmas Day (boo!) Santa is actually coming to our house Christmas night and we will celebrate as a family the day after. 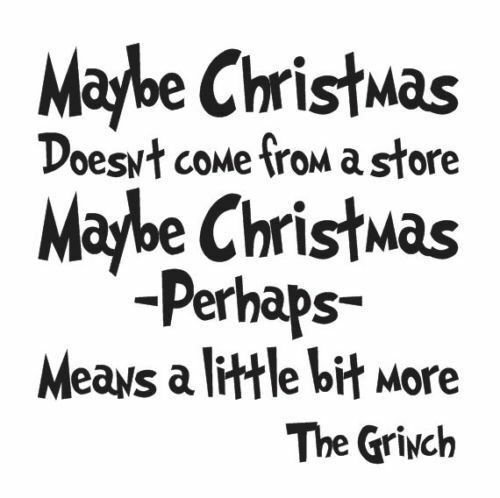 I hope everyone has a very merry Christmas! It’s practically here!